2006年 3月 性能提升。增加：Ekiga 原先叫做GNOME Meeting，GNOME 个语音搭 IP 视频客户端；任务栏搜索工具；Pessulus 锁定管理器（允许管理员方便个禁用 GNOME 桌面个特定特性）；快速个用户切换；Sabayon 配置编辑器（允许管理员来实时搭互动个 GNOME 会话里向设置用户配置文件）. 2006年 9月 性能提升。增加：Tomboy 智能个wiki笔记本程序；Baobab 磁盘存储份额管理；屏幕保护个全屏预览支持；Totem 有一些轻微个改进；改进著 Nautilus；整合著支持笔记本个电源管理功能；Metacity添加compositing支持；新个图标主题。基于GTK+2.10库，新个打印对话框搭它个API. 2010年3月 Nautilus文件浏览器、Empathy即时通信、便签、Evince PDF阅读器、Time Tracker、Vinagre VNC客户端搭Epiphany浏览器个改进。iPod 搭 iPod Touch设备可通过libmobiledevice来gvfs支持。使用GTK+ 2.20. ↑ About Us | GNOME. 访问日脚2013-03-10. ↑ Michael Larabel (January 29, 2008). "Eight Interesting Improvements In GNOME 2.22". phoronix. http://www.phoronix.com/scan.php?page=article&item=980&num=1. Retrieved 2008-01-30. ↑ GNOME 2.22 Release Notes. ↑ Holwerda, Thom (2010-03-31). 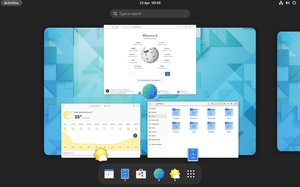 GNOME 2.30 Released. OS News. 访问日脚2010-04-04. ↑ GNOME 2.32 Release Notes. 访问日脚October 31, 2010. ↑ GNOME 3.0 Release Notes. 访问日脚April 7, 2011.